The contemporary design of the Hera gray leather chair is perfect for a home office or for welcoming clients into your reception area. Designed for ultimate comfort, the Hera has sloping arms, a slightly curved seat and back and a fixed seat cushion. ontemporary DesignIntegrated Curved ArmsLumbar PillowSeat CushionSwivel SeatChrome BaseWhite Leather.. 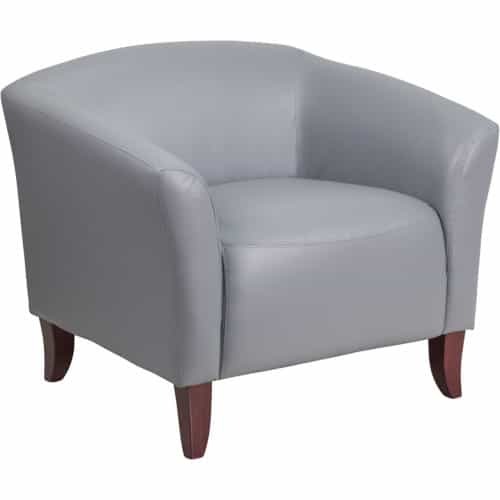 Contemporary DesignIntegrated Curved ArmsLumbar PillowSeat CushionSwivel SeatChrome BaseGray Leather.. Contemporary DesignIntegrated Curved ArmsLumbar PillowSeat CushionSwivel SeatChrome BaseRed LeatherS.. Contemporary DesignLight Gray Fabric UpholsteryIntegrated Curved ArmsLumbar PillowSeat CushionSwivel..
High Back Design with HeadrestStorm Gray Vinyl UpholsteryContrasting White StitchingBuilt-In Lumbar ..